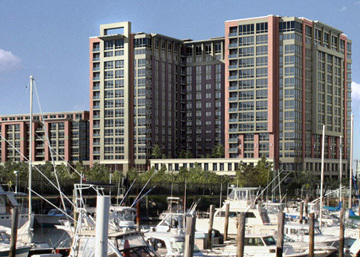 Gull's Cove is a luxury condominium located in the Historic Downtown Area at 201 Marin Boulevard in Jersey City, New Jersey. 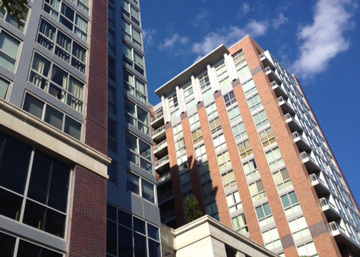 Residents enjoy a combination of luxury, convenience and oversized modern apartments. With a 24/7 Concierge, beautiful lobby, two common outdoor patios, indoor (deeded) parking, the Hudson-Bergen light rail just outside the front door and the Grove Street Path station a few blocks away, Gull's Cove is a perfect place to live. Also, to the convenience of all residents, there is a doggie daycare center, dry cleaner, child day care, urgent-care medical facility, dental office and a "club" establishment featuring bowling alleys, Pellaton bikes, child play area and event spaces on the first floor of the building. Additional commercial facilities coming soon include a Physical Therapy facility, specialized gym and student tutoring facility.